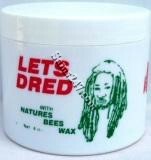 Nature's natural bees wax for today's dreadlocks hearstyles. Ingredients: 100% Bees wax. INGREDIENTS: Anhydrous soap, perfume, triclosan, phosphoric acid, titanium dioxide, preservative, sodium EDTA, ADPA, water, colourants.